Goalkeeper Colin Stewart has hit out at former club Ross County after signing for Partick Thistle along with striker Mark Roberts, who left Airdrie United. Stewart, released by County, replaces Neil Bennett, who has exited Firhill. "I have a very sour taste in my mouth the way things ended at Ross County," said Stewart, who is also a coach. "They have their way of doing things, probably not the right way, but it is good to be back involved with a more professional club." County chairman Peter Swanson had said in June that it was financial pressures that meant that the First Division club "had no alternative" to allow Stewart and midfielder Fergus Tiernan to seek new clubs. Tiernan has since re-joined County. But former Kilmarnock keeper Stewart, who had offers to move to England, will now provide back-up to Kenny Arthur at Second Division Thistle. "I realise that I am going to have to fight for the number one jersey as I know Kenny is doing very well and I have come up against him many times in the past and have also worked with him at International level as well," said Stewart. 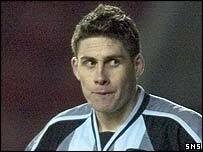 Meanwhile, Roberts, who had started all three of Airdrie's games this season, had been at New Broomfield since arriving from St Mirren in 2003. "There are not many strikers here at the moment," said Roberts, who started his senior career with Kilmarnock and also played with Falkirk and Shelbourne. "But, if we all stick together, we can get the club through this bad spell and back up the leagues, something that is necessary for this club. "Perhaps my main strength over the years has been link-up play rather than out and out goalscorer, but I will score goals if given the chances." Airdrie manager Sandy Stewart was working late into Friday evening in the hope of bringing in a replacement capable of helping his side break their competitive scoring duck this season. He has targeted a striker presently with a Scottish Premier League club.